Right so now that the sun is out I can see all the defects left by the dealership when they prepped the car after it first arrived. I'm reasonably good with a DA now but my old car did not have gloss plastics, and I've seen today after a wash plenty of swirls (I hope not created by me and my washmitt) all over the B pillar plastics. So I want to know the best method of getting rid of them and then protecting the plastic to prevent further swirls? Any help is appreciated. B pillars are always the first to swirl. And the gloss black plastics. DA will do it. Usual correction and refinement process applies, but ideally you need spot pads for B pillars. Even smaller for some of the other gloss black trim. I’ve recently bought a Rupes Mini Bigfoot to tackle smaller areas (as my Das Pro Plus doesn’t take spot pads), but even that might struggle on some of the very small trim parts. Rupes IBrid would be up to the job but very expensive bit of kit but there are other options. I’d start with spot pads on your existing DA and see where that takes you. Once corrected, a decent sealant to protect, but keeping future swirls at bay is all down to careful washing, drying and protection techniques. No sealant can stop swirls. The smallest pads I've got are 3 inch so will have to shop around for some smaller ones and a backing plate to go with it. That marquee from your linked post is the dream! I'm trying to borrow a family friend's but it is smaller and will only offer shade and not all round coverage. Results were great on those b-pillars! Plan was to attack with a hex logic finishing pad and 205, but will search for a spot pad instead, is there any particular one you recommend? Also slightly derailing my own thread, I had a nose through your thread and noticed for your decon stage you used iron X and a fallout remover, is that not much of the same or do they attack 2 seperate things? 3” spots will be fine for B pillars. I did mine with 5” pads and they were fine apart from some tiny areas at the base of the pillar which the pad was just too big for, but a 3”pad will be perfect. It’s only on trim like the rear window gloss plastic fins, and some front grill areas that even a 3”pad would struggle to reach. No, they are the same thing. I used Iron X (iron/fallout remover), and then another similar fallout remover, Obsessive Detail fallout remover, as I ran out of Iron X, but it was all for the same job of removing iron/fallout deposits. Then I used Tardis (tar/glue remover), then clayed to remove any remaining embedded contaminants. Was going to say you can do B pillars with a 130mm pad. This is a RS3 I did, single stage machine polish with my Flex Rotary. Not perfect but night and day difference. simple answer is do as I do with all my cars, go to good detailer and get a full paint correction done and then paint protection. 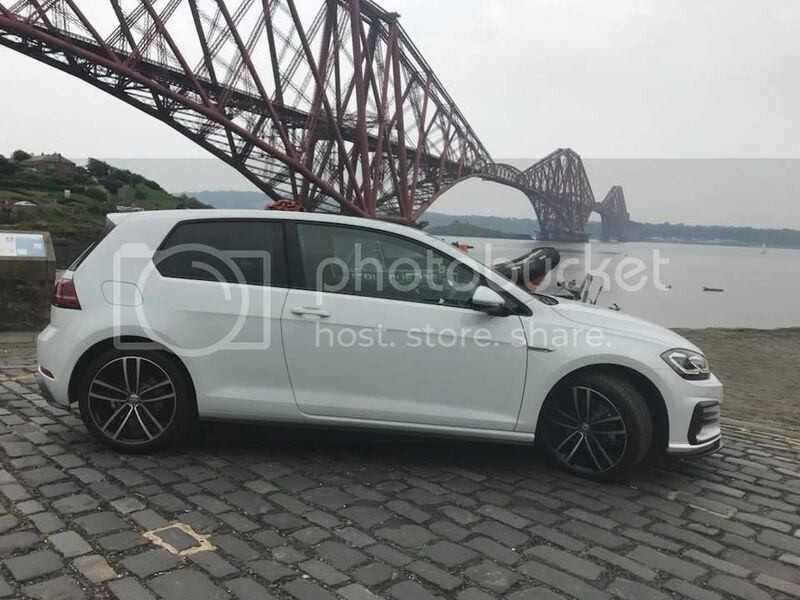 2018 MK 7.5 GTD 3 Dr in Pure White,Extras,Front Splitter, Carbon Exhaust Tips. Some people enjoy doing the detailing themselves.